— If you are in Yorkshire on Tuesday 4th December, please join us for a peaceful protest in Goole to oppose Drax Power Station’s climate-choking application to build the U.K’s largest ever gas power plant. From 1.45pm-3pm, climate and energy justice campaigners will be gathering outside the Planning Inspectorate Open Floor Hearing for Drax’s gas application, held at Goole Leisure Centre, North Street, Goole DN14 5QX. We will then atttend the hearing from 3-4pm. Everyone is welcome to join us and there will be speakers, music and colourful placards. Drax power station is the biggest burner of wood for electricity in the world, damaging forests and biodiversity, polluting communities (including many in Yorkshire) and making climate change worse. It is still burning coal and has now applied to the Planning Inspectorate to replace its remaining coal-burning units with the UK’s largest ever gas power plant. All of these are incompatible with a good outcome on climate change. Both Biofuelwatch and ClientEarth have submitted formal objections to Drax’s gas plans because they will breach the UK’s international climate change commitments at a time when we urgently need to reduce our greenhouse gas emissions in order to prevent catastrophic climate change. The final decision on the application will be made next year but this meeting is a vital opportunity to highlight the climate, environmental and health impacts of Drax’s gas plans. 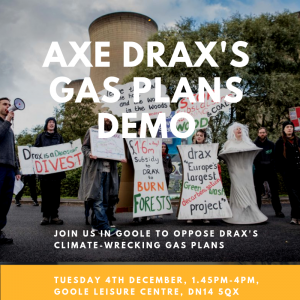 If you are able to be in Yorkshire on Tuesday 4th December, please join us outside the Planning Inspectorate’s Open Floor Hearing on Drax’s proposal in Goole Leisure Centre from 1.45pm to highlight Drax’s climate-wrecking gas plans to the general public, investors and the news media. We will leaflet attenders, hold a peaceful and lively banner protest and explain why Drax is not part of the solution to our energy needs. Everyone is welcome and please bring your banners and signs! Please get in touch at biofuelwatch[at]gmail.com if you have any questions about the protest and if you would like to arrange to meet up and travel together with other campaigners. The Open Letter to the Secretary of State for Business, Energy and Industrial Strategy to oppose Drax’s gas plans is still open for environmental groups and organisations to sign. If your group would like to sign, please email biofuelwatch[at}gmail.com.